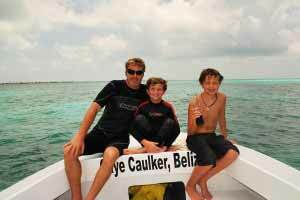 As their motto implies, Belize’s magnificent sites, rich culture, adventure activities and gorgeous scenery – both above and below the water – make it “Un-Belize-Able” for family travel. With the jungle and the beaches so close together (just a few hours drive to experience the best of both), it’s easy to combine destinations for an adventurous, yet relaxing vacation. 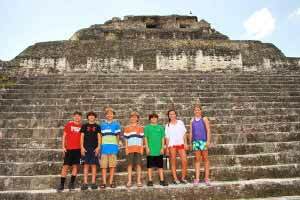 We decided to experience three famous sides of Belize: a caye (small Caribbean island), the jungle and a beach town in the south of the country. 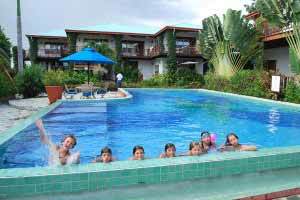 And we asked a couple of other families to come along for a multi-family trip to see how other families experience traveling together. We took the ferry from Chetumal in Mexico’s Yucatan Peninsula through Ambergis Caye in Belize - a very popular destination for foreign travelers – and on to it’s smaller sibling to the south, Caye Caulker. 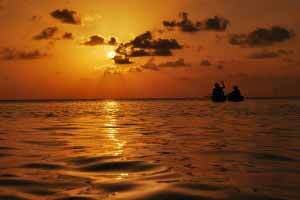 With a population of just over 1,000 people, Caye Caulker maintains a small town, beach vibe that kids really enjoy. There are no paved roads, and there are only 4 cars on the island, so the kids have free reign riding their bikes along the beach front (watching out for the occasional golf cart). The beach front “road” is lined with casual outdoor restaurants and shops, but the highlight for the kids were the puppies (they really wanted me to tuck one in our luggage) We stayed at Sea Dreams Hotel on Caye Caulker’s north side. We felt very at home at this family-run hotel where the staff always seemed to have a smile…and it was very contagious. The variety of rooms offered something for everyone including 1- and 2-bedroom apartments and a beach house that are perfect for families. About 20 steps takes you to there private dock where you can snorkel or take their canoe out. To get a better peek under the waves, we headed on a scuba dive with Frenchie’s Diving. 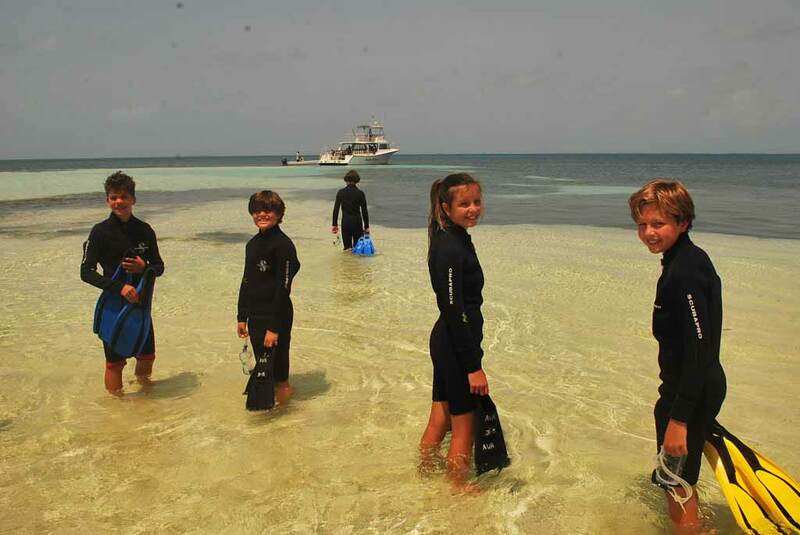 They took the four of us, including 10 year-old Seamus who had not yet gotten certified to dive (a situation that was rectified a few weeks later), to a spot just 5 minutes off-shore where sharks and sting rays congregate (similar to Shark Ray Alley in nearby Hol Chan Marine Reserve). Within minutes of descending the all of 8-feet to the bottom, we were surrounded by sting rays. They glided by, appearing weightless, swerving in and away. Their “wings” felt slippery as they brushed past slurping at bits of fish and shrimp in the water. The nurse sharks were a bit more reserved circling at a safe distance of about 20-feet. The kids were in awe as the creatures grouped around in this underwater mingle. Just a two-hour drive from Belize City, San Ignacio is a small town tucked in the vast green jungle surrounds. 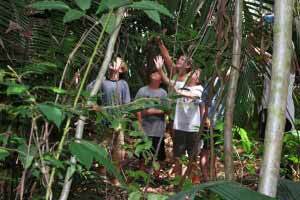 Punctuated by Mayan pyramids and caves, the jungle holds a sense of mystery that the kids found fascinating…oh and lots of bugs, which of our boys LOVED! We stayed about 10 minutes out of town at Chaa Creek, a resort situated on its own reserve. They kids loved swinging on the hammocks on the deck of our cottage spotting caterpillars, geckos, iguanas, butterflies and more. In the evenings and mornings, they loved listening to the call of the howler monkeys…they sounded like a bunch of wild hogs snorting away. The first night we enjoyed a five-course gourmet meal including mango salad, snapper in a wine sauce and of course kid favorites like pizza and chocolate cake. At night, we took a guided tour through the jungle and saw moths, leaf cutter ants, a kinkajou, a garden snake, a scorpion and lots of spiders, but the highlight for the kids was “tarantula city”…an area with dozens of tarantula holes (note to self: don’t go barefoot). The guide wiggled a stick in the grass in front of one hole and out popped the tarantula, providing an evening of entertainment for the kids (supervised of course). Within 10 minutes of Chaa Creek, Xunantunich pyramids pop through the canopy. After crossing the river by hand-cranked ferry, we walked up a path for a few minutes and there before us rose the massive Mayan structure…looming at least as tall as a four-story building. We hiked to the top for incredible views over the verdant jungles with hints of other Mayan pyramids peeking through the leaves. It’s mind-boggling to think about the enormity of the Mayan civilization that once inhabited this jungle. As we sit there, admiring the architecture, I can just imagine the Mayans hustling around the base while the priests prepare for a ceremony at the top of the great pyramid. 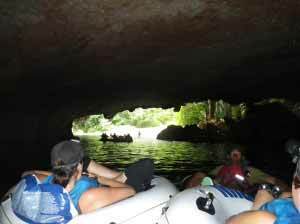 The next day, the kids are keen to explore more of the jungle, so we book a cave tubing tour with Cave Tubing R Us. As we hike through the forest, our guide David tells the kids all about each tree and plant. The kids are fascinated by the medicinal plants and think it’s very interesting that nature usually puts a “cure” plant near a poisonous one…I’m just glad they didn’t put it to the test. They love tasting all the tropical fruits right from the tree, but the most talked about snack was the termites. Yes, everyone tried one…even the 14-year old girl (I won’t name any names). After about 30 minutes walking, and a very long break where the kids were cliff diving (over and over again), we arrived at the put-in place in the river. We hopped in our tubes and before we knew it we were in our first cave. Head lamps helped illuminate strange rock formations in all sorts of shapes (good exercise for the kids’ imaginations), an occasional bat and a rushing waterfall. The kids said they felt like Indiana Jones as slices of light from holes above sliced through the darkness. It was a true adventure! 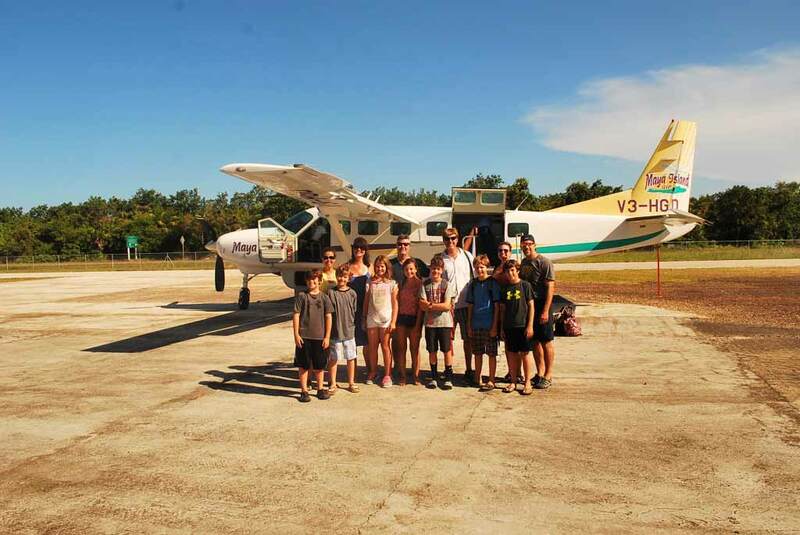 From the jungles to the beach: We hopped a Maya Island Air flight from Belize City to Placencia. Beautiful views of the coastline from the plane, smooth ride, and quite an adventure for the kids! They even had one of the kids, 10 year-old Phoebe, sit in the co-pilot seat and let her help fly the plane! (Our group was the only one on the flight). Flight from Belize City to Placencia 10-year old Phoebe got to help fly the plane! Located on a long Peninsula about 2/3 of the way down the coast of Belize, Placencia is a small village filled with a fun vibe, lots of funky restaurants and shops and friendly people. We stayed about 1/4 mile north of the village at Chabil Mar Villas, an elegant resort with a barefoot casualness about it. 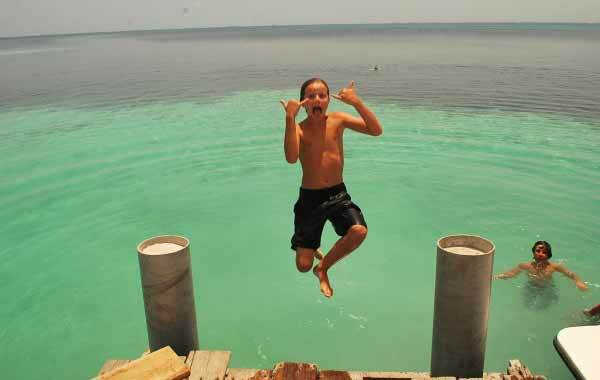 The kids loved swimming in the pool and jumping off the dock into the ocean. We enjoyed the full-service…always with a friendly smile! We all enjoyed riding bikes and kayaks. Golf carts are the mode of transportation in Placencia (although there is a paved road and cars as well). For meals, we ate at the resort a couple of evenings – they do not have one restaurant, but instead will deliver your meal wherever you would like to enjoy it in the resort…a great concept for families! We ate on our balcony and at dining tables on the beachfront, but you could also be served out on the pier or in the BBQ area. We also headed into town for some meals – highlights included stuffed jacks at De’Tatch, the fun atmosphere of the Pickled Parrot (uber-welcoming owners Eugene, Lynn and Tommy and a nearby playground made us all feel right at home), lobster cakes at The Secret Garden and burritos ($1.50) from a cart along the road. 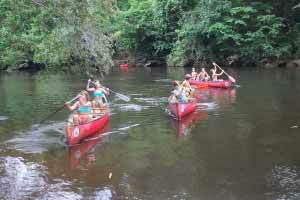 After our time in the jungle hearing the grunting of the howler monkeys, the kids are keen to see some, so we head out with Monkey River Eco Tours, for a guided boat ride upriver. After winding through the maze-like paths through the mangroves across the lagoon from Placencia, the guide tells us about his hometown, Monkey River, at the mouth of the river. Along the river, he points out iguanas, birds and a crocodile. Then he pulls over to a bank and off we hop for a short hike…and short it is! After about 10 feet of hiking, we find a troop of howler monkeys - including a couple of babies. They come down from the trees searching for food and get within 8 feet of us. Watching the kids faces as they gaze in awe at the monkeys makes the trip! 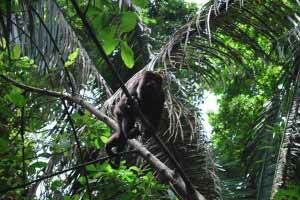 Their faces change – accompanied by “ewww” and laughing and shrieks – as the monkeys turn the tree we are standing under into a port-a-potty; an easy way to get the kids dashing back to the boat! While the kids have fun jumping off the pier and checking out the fish, we’re told the crystal clear waters the Caribbean is known for lie just off shore on the barrier reef (the second longest barrier reef in the world). So, we head out with Avadon Divers for a day of scuba diving on the reef. Out of the 13 people we are traveling with, only 3 of us (including Nathan, our 12 year-old boy) are certified. So, Avadon sends plenty of dive masters to support an enjoyable Discover Scuba Dive. They start out with a short class about diving – including essential skills you will have to perform in shallow water prior to diving. The first dive starts with each student performing skills like clearing their masks and retrieving a lost regulator. They we swim around checking out small coral heads. The second dive is off the boat where we spot huge coral formations, brain coral covered in Christmas tree worms, lots of fish, a shy lobster, an Eagle Ray and more. I’m busy counting kids (and adults) but enjoy watching them discover a whole new world!